Births William Sullins was born in 1828 in Rutherford County, North Carolina. Deaths Herrod Rudd died in 1829 in McMinn County, Tennessee (my 5th great-grandfather). Elizabeth Sophronia (Lytle) Burgin died in 1837 in Burke County, North Carolina. Calvin M. Stroud died in 1821. 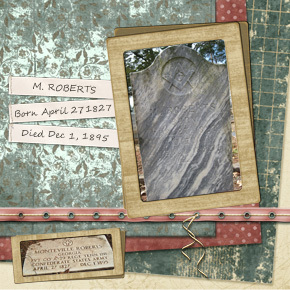 Births Monteville Roberts was born in 1827 in McMinn County, Tennessee (my 3rd great-grandfather). Marriages Henry Naugle and Elizabeth Whitener were married in 1826 in Lincoln County, North Carolina. Births Elizabeth (Kendrick) O’Neal was born in 1811 in McMinn County, Tennessee. Walter Patton Hemphill was born in 1868 in Georgia. Cordeale Josephine (Kendrick) Caylor was born in 1871 in Georgia.